Svelte, purely-digital and a wee-bit pricey, the PSPgo officially hit stores today. Whether you're on the fence about whether to buy a PSPgo or are trying to decide how best to load your newly acquired system with games and peripherals, we've got you covered. Here for your quick perusal is a run down of everything we know and think about the PSPgo. You can also use this handy-dandy guide as a jump off point for your own discussions about the pros and cons of PSPgo ownership. Pros: Smaller, lighter, sexier, Sixaxis support, digital only. Cons: No UMD support, costly. Online Gaming: Infrastructure and Ad Hoc for both. Movies: Purchase and rental for both. Internet Browsing: Yes for both. Connect to Console: Remote Play for both. Store: Playstation Store for both. Parental Controls: Yes for both. Coming soon to augment the $250 PSPgo are an eclectic collection of add-ons. Here's a closer look at what you can pick up once they hit stores. Hold the PSPgo for charging or while connected to a television. Cables not included. Unfortunately, the PSPgo doesn't support the Memory Stick Duo or any of its predecessors. This is just a prototype, but when released this converter will allow you to use your Playstation Portable peripherals with your PSPgo, in theory. A last minute firmware update hit on the eve of the PSPgo hitting stores. The update added, among other things, the ability to connect your PSPgo to a cellphone with Bluetooth and connect to the internet and the Playstation Store that way. Unfortunately, as of this writing Apple's iPhone doesn't support tethering. Big surprise there. The update also added SensMe music categorization support to both the PSPgo and PSP and overhauled the Playstation Store interface. 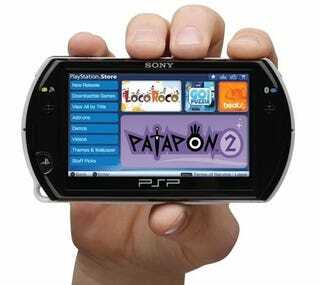 While the diminutive, and less pricey, minis will play on both the Playstation Portable and the PSPgo, their launch was timed to the release of the new download-only portable. Of the seven currently available for purchase for $5 to $10, we found that five of the seven were probably worth picking up. Moving forward, Sony says that all games released for the Playstation Portable as a UMD will also be released as a downloadable title. To prove that point, the store added more than 90 Playstation Portable games, previously available on UMD, the day the system hit. Among the top tier are games like Gran Turismo, which we'll be reviewing on Monday, and PixelJunk Monsters Deluxe. My short time with the game convinced me that the stylish tower defense game, which rings in at $20, is a must have for the PSP or PSPgo.